Most of our fat intake comes from three types of fatty acids: polyunsaturated, monounsaturated, and saturated. Each one has unique properties that interact with our bodies in different ways. Polyunsaturated fats, in particular, sparked the first investigations into how certain fats may be essential for optimal health, growth, and development. This led to the discovery of omega-6s, omega-3s, and what we now know as “essential fatty acids” — which are all polyunsaturated fats. Despite the scientific consensus that polyunsaturated fats are “healthy” fats, emerging research indicates they should not be considered as healthy in every context. Polyunsaturated fat vs. monounsaturated fat: what’s the difference? How much polyunsaturated fat should we eat for optimal health? Polyunsaturated fats or PUFAs (the abbreviation of “polyunsaturated fatty acids”) are typically referred to as “oils” because they are liquid at room temperature. They are found in most foods but exist in the highest quantities in fatty fish, plant-based oils, seeds, and nuts. The first polyunsaturated fatty acid was discovered in the early 1930s — the omega-6 PUFA that we know as linoleic acid. This, as well as the omega-3 PUFA called α-linolenic acid (ALA), are known as essential fats because the human body cannot synthesize them. These two PUFAs are also representative of the two classes of polyunsaturated fats: omega-3s and omega-6s. However, before we dive into the different PUFA types, let’s take a closer look at polyunsaturated fats to get a better idea of what we are looking at. All fats have a similar chemical structure — i.e., a chain of carbon atoms bonded to hydrogen atoms. What makes one fat different from another is the length of the carbon chain and how many double bonds it contains. Seemingly slight differences in structure can translate to incredible differences in form and function. Polyunsaturated fats are fatty acid molecules that have more than one carbon-to-carbon double bond. These double bonds play a significant role in determining the chemical properties of the fatty acid. For example, high-PUFA oils are liquid at room temperature because they mostly consist of fatty acid chains with double bonds. In contrast, animal fats and coconut oil are solid at room temperature because they primarily contain saturated fats, which are fatty acid chains of single bonded carbon atoms. Carbon-to-carbon double bonds also play a role in how the fatty acid impacts our health. Polyunsaturated fats and monounsaturated fats, for example, are both considered to be healthy fats, and their double bonds are what set them apart from other types of fat. The number of double bonds makes a substantial difference as well. In fact, PUFAs have been shown to reduce several risk factors for heart disease more substantially than monounsaturated fats. To understand why this may be the case, let’s explore the key differences between these two “healthy” fats. Polyunsaturated Fat vs. Monounsaturated Fat: What is the Difference? Both of these fats are unsaturated fats, which means that they have at least one double bond between their carbon atoms. They diverge, however, when we look closely at the number of double bonds. All monounsaturated fats or MUFAs have only one double bond. The prefix, “mono-” (meaning “one”), lets us know that there is only one carbon-to-carbon double bond in that fatty acid. In contrast, all polyunsaturated fatty acids have more than one carbon-to-carbon double bond. “Poly-” (meaning “more than one”) tells us that there are two or more double bonds in the carbon chain. As mentioned earlier, the number of double bonds plays a crucial role in how fatty acid affects our health. This is why it is helpful to differentiate between “mono-” and “poly-” unsaturated fats. However, this doesn’t mean that all polyunsaturated fats will have similar effects because they are in the same fatty acid category. The location of the double bonds matters as well. In fact, double-bond location is so important that PUFAs have been separated into two categories based on the location of a particular double bond in its carbon chain. Polyunsaturated fats typically exist as either omega-3 or omega-6 fatty acids in nature. The deciphering factor between them is where the first carbon-to-carbon double bond is located from the terminal methyl group of the fatty acid chain. More specifically, omega-3 fatty acids have a double bond three carbons away from the methyl group, whereas omega-6 fatty acids have a double bond six carbons away from the methyl group. Both fatty acid chains have the exact same amount of carbon, hydrogen, and oxygen molecules as well as carbon-to-carbon double bonds. They are virtually identical until you look at the location of the double bonds. Each double bond introduces a kink in the chain that influences how we metabolize the fatty acid. Thus, omega-6s and omega-3s have kinks at different parts in their chain. As a result, an omega-6 and omega-3 fat that have identical components, yet vary in their double bond location will have different effects throughout the body. In fact, closely related omega-3 and omega-6 fatty acids have been found to act as competing substrates for the same enzymes, which can alter various metabolic processes. This hints at the importance of the ratio of omega-3 to omega-6 fatty acids in a diet — a topic that we will touch on later in this article. As with every natural food component, context is key. To get a better idea of the benefits and potential harms of these PUFAs, let’s take a closer look at the diet literature. Polyunsaturated fats offer many impressive health benefits despite their varying properties. Omega-3s may improve overall brain health. Omega-3s can help treat Rheumatoid arthritis. Omega-3s and omega-6s ensure optimal infant development. Polyunsaturated fats can promote heart health. Omega-6 and omega-3s can help improve immune system function. Polyunsaturated fats reduce type 2 diabetes risk and improve blood sugar regulation. Omega-3s may have anti-cancer effects. PUFA consumption may increase longevity. In each benefit’s section, we will take a closer look at the research behind these findings and explore how particular omega-3s and omega-6s can help us. Omega-3 fatty acids, specifically DHA and EPA, are crucial for optimal brain development and function. Observational studies have found an association between low blood levels of DHA with mental decline in older adults. Several clinical trials have been conducted to explore this relationship. The most promising finding was that omega-3 supplementation helped subjects with mild cognitive impairment improve certain aspects of cognitive function, including attention, processing speed, and short-term memory recall. However, the same cannot be said for healthy adults and Alzheimer’s disease patients. Several systematic reviews and meta-analyses indicate that omega-3 supplementation does not significantly benefit the cognitive health of these populations. Although the current data doesn’t seem convincing, some researchers speculate that omega-3 supplementation may only benefit those who are deficient in these fatty acids. Once a certain threshold of consumption is reached, there may be no additional benefit for cognitive health. Omega-3s are most well-known for their anti-inflammatory properties. This lead researchers to investigate the effects these fatty acids may have on Rheumatoid arthritis, an inflammatory condition that is particularly difficult to manage and treat. Several studies on subjects with this condition indicate that DHA and EPA supplementation can help reduce joint swelling and pain, morning stiffness, and the number of painful joints in addition to decreasing NSAID use. However, more research is needed to confirm these findings. Both types of PUFAs have been found to improve various aspects of infant development. More specifically, omega-3 fat consumption during pregnancy, either in the diet or via supplements, is associated with improved cognitive development in the child. The most encouraging conclusions are from a recent systematic review that suggests pregnant women could benefit from DHA and EPA supplementation as a means to increase the length of gestation, prevent preterm birth, and reduce the likelihood of low birth weight. To help meet the DHA and EPA needs of mother and her infant, it’s recommended that pregnant or breastfeeding women consume at least 8 but no more than 12 ounces of low-mercury fish every week. Pregnant women should limit or avoid fish with the highest mercury levels, including marlin, orange roughy, swordfish, tuna, and shark. The best choice would be a fish that is high in omega-3s and low in mercury. This includes wild-caught salmon, sardines, and mackerel. Also worth noting are the potential benefits of omega-6s on the development of an infant’s immune system. Although omega-6s are typically known as inflammatory, they can help promote and modulate immune responses to different foods and parasites. Arachidonic acid, for example, is an omega-6 fatty acid that can help improve immune system function and reduce the likelihood that children will develop food allergies as they mature. Of the two classes of PUFAs, omega-3s s are renowned for their positive effects on the heart. Overall, research indicates that consuming fish and other types of seafood as part of a balanced diet promotes heart health. Some studies even suggest that EPA and DHA may help prevent heart disease and stroke. However, this doesn’t mean that everyone should up their DHA and EPA intake with fish oil supplements. Many randomized control trials have found mixed results with omega-3 fish oil supplementation. For example, a review of 10 studies in nearly 78,000 people prone to heart disease saw no benefit of omega-3 supplements on risk of heart attack, stroke, or any other related trauma. Similar results were found for healthy individuals as well. That being said, fish oil supplements have been proven effective at lowering triglyceride levels, which can help reduce your risk of heart disease and stroke. Omega-6s have beneficial effects on heart health as well. The current data from randomized trials, observational studies, and long-term animal feeding experiments indicate that the consumption of at least 5% to 10% of energy from omega-6 PUFAs reduces the risk of cardiovascular disease when compared to lower intakes. This reduction may be explained by clinical trial data showing that omega-6 fats can reduce blood cholesterol, LDL-C, and triglyceride levels. In fact, PUFA consumption, in general, has been found to have beneficial effects on cholesterol and triglycerides levels. One meta-analysis, for example, found that replacing carbs with polyunsaturated fats leads to a significant reduction in triglyceride levels. More specifically, for every 1% isoenergetic replacement with polyunsaturated fat, there was a reduction in triglycerides by 2.3 mg/dL. This represents a more significant decrease than any other fat. Another meta-analysis of 60 feeding studies found that the substitution of PUFA (primarily omega-6) for carbohydrates had more favorable effects on the ratio of total to HDL cholesterol (a fairly accurate predictor of heart disease risk) than any other class of fatty acids. In short, omega-3s and omega-6s are crucial for optimal heart health, but supplementing with them is likely unnecessary for most people. The healthiest strategy is to replace processed carbs, trans fat, and some saturated fat with healthy foods that’ll help you meet your omega-6 and omega-3 needs. For example, you can replace a red meat dish with a salmon dish 1-2 times a week to help meet your omega-3 needs and snack on some raw nuts and seeds instead of potato chips to get a healthy source of omega-6s. Arachidonic acid, DHA, and EPA all can exert potent effects on the immune system. Arachidonic acid, for example, can help promote and modulate immune responses that are critically important in the resistance to parasites and allergic reaction. In other words, this omega-6 fatty acid can be used to help us differentiate the good from the bad, preventing unnecessary allergic reactions to food and protecting us from harmful invaders. In contrast, DHA and EPA illicit anti-inflammatory mechanisms that may help bring an overactive immune system back into balance. This could potentially help reduce the risk of developing autoimmunity. A recent meta-analysis of randomized controlled feeding trials found that, In comparison to carbohydrates, saturated fats, and monounsaturated fats, PUFAs exert the most consistent favorable effects on metrics associated with improved blood sugar levels, insulin resistance, and insulin secretion capacity. Omega-3s and omega-6s both seem to play a role in these positive findings. Research indicates that subjects with higher blood levels of the essential omega-6 fatty acid, linoleic acid, may be 35% less likely to develop type 2 diabetes. Omega-3s have the potential to decrease the risk of type 2 diabetes as well. Due to their anti-inflammatory properties, researchers speculate that omega-3s mitigate some of the inflammatory processes responsible for increasing insulin resistance. This might help prevent type 2 diabetes at a cellular level. Animal trials and mechanistic investigations have found that omega-3s can weaken cancer cells and prevent their proliferation. Researchers speculate that their ability to modulate gene expression involved in cancer development and suppress systemic inflammation play a crucial role in these positive findings. The data regarding the effects of omega-3s on cancer patients, however, is inconclusive. Some studies have shown associations between higher intakes and/or blood levels of omega-3s and a decreased risk of certain cancers, including breast and colorectal cancer, while other studies found no associations with cancer risk. Research on the Mediterranean diet, which features more PUFA-rich whole foods and less saturated fat than westernized diets, indicates that PUFAs may play a role in reducing heart disease and all-cause mortality risk. Observational studies have also discovered an association between the intake of EPA + DHA and reduced risk of all-cause mortality. However, emerging evidence suggests that it may not be prudent to eat copious amounts of PUFAs to enhance health and longevity. Overeating omega-6 fatty acids, for example, may promote several chronic diseases. The quality of the polyunsaturated fats we consume plays a critical role in their health effects as well. Most heavily processed PUFA-rich products, for example, contain oxidized PUFA molecules that are deleterious to health. To maximize the benefits we reap from PUFA consumption, we must be mindful of how these delicate fats are treated before they reach our mouths. Although PUFAs confer unique and significant health benefits when compared to other types of fats, they do have a dark side. If you are not mindful of the following three potential harms, the “healthy” fats you consume may actually end up worsening your health. As we learned earlier, the two types of polyunsaturated fats, omega-3s and omega-6s, play crucial roles in regulating inflammation. In general, omega-3s tend to be anti-inflammatory while omega-6s are typically pro-inflammatory. Many researchers hypothesize that consuming too many omega-6s in relation to omega-3s will promote chronic inflammation and contribute to poor health outcomes. Mechanisms for how high omega-6 intake and insufficient omega-3 consumption may provoke obesity, heart disease, cancer, type 2 diabetes, and cognitive decline have also been discovered. That being said, other research groups have concluded that the omega-6 to omega-3 ratio is not a good indicator for overall health. They believe the current data indicates that meeting omega-3 and omega-6 needs are what matters most. Manipulating our intake to match specific omega fatty acid ratios is likely not necessary. In short, more research needs to be done to show the clinical significance of the omega-6 to omega-3 ratio. For now, science shows that it’s crucial to get the proper amount of omega-3 fatty acids and omega-6 fatty acids from nutrient-rich sources such as fatty fish, nuts, seeds, eggs, and fresh meat. This simple strategy will ensure that you get the benefits you expect from PUFAs. Plus, by consuming nutrient-rich whole foods, you can help mitigate the 2nd issue with these delicate fats as well. Polyunsaturated fats are more vulnerable to oxidation than other fats because of their multiple double bonds. Excess air, light, and heat exposure can all cause PUFAs to break down into harmful compounds. Once this happens, all of the potential benefits of these fats are replaced by toxic chemicals that worsen your health. Because of this, high-PUFA foods and oils should be stored in a cool dark place and prepared using low cooking temperatures. This will help you minimize harm and maximize the benefits of polyunsaturated fats. Just because they are known as healthy fats doesn’t mean you should consume as much as possible. All fats, including polyunsaturated fats, contain 9 calories per gram — more than twice the calories found in carbs or protein. If you’re not careful with your PUFA consumption, you might exceed your calorie needs and gain fat. Consume an adequate amount of omega-3s and omega-6s from nutrient-rich whole food sources. Prepare and store those high-PUFA foods/oils properly to prevent oxidation. Replace some of your current trans fat, saturated fat, and/or carb intake with these healthy fats to get the most benefit. 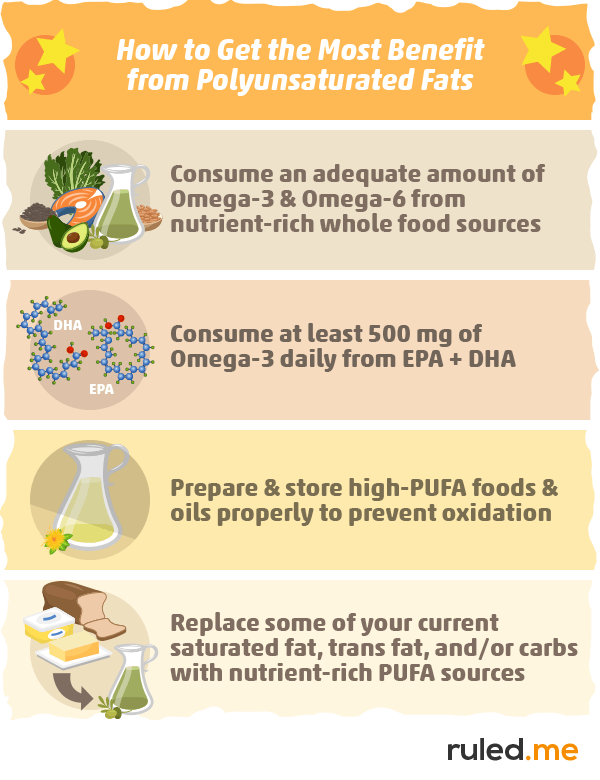 To properly implement these suggestions, we will take a closer look at how much PUFAs we should consume and what the healthiest sources of omega-3s and omega-6s are. There is no recommended polyunsaturated fat intake for optimal health. Instead, the typical suggestion is to replace trans fats and saturated fats with polyunsaturated fats. However, consuming most of your fat from omega-3s and omega-6s may not be prudent either, given the potential for oxidation and the lack of research supporting excessive PUFA intake. That being said, it is crucial to make sure we are getting an adequate amount of omega-3a and omega-6s for optimal health. The World Health Organization recommends an omega-3 fatty acid intake of 0.5–2% of energy per day. The American Heart Association specifically recommends that we get at least two servings of fatty fish per week or 500 mg EPA + DHA per day. The highest intake recommendation I’ve found is for patients who need to lower their triglyceride levels. These individuals have been found to benefit from 2–4 grams per day of EPA + DHA supplements under a physician’s care. Altogether, these recommended intakes represent an estimated amount of omega-6 and omega-3 we need for optimal health. The healthiest way to meet these needs is by replacing heavily processed foods and oils with the nutrient-rich foods found in the next section. There are plenty of PUFA-rich food and oil options, but all of them aren’t going to promote optimal health. Most High-PUFA oils, for example, represent the least healthy way to up your fat intake. Be cautious of the “heart-healthy” labeling that many common vegetable oils have. As soon as they are exposed to heat, light, or air, they will start breaking down into compounds that can actually provoke heart disease. Plus, high-PUFA oils typically don’t contain the other health-promoting nutrients that are found in PUFA-rich whole foods. Because of these two factors, we have not included any high-PUFA oils in our healthy omega-3 and omega-6 food lists. By using this list and the recommended omega-3 intakes from the previous section, you will be able to figure out how you can meet your needs every day. However, make sure you are not relying on ALA intake to meet your EPA and DHA needs. Most of the benefits of omega-3s come from consuming EPA and DHA directly. These lists aren’t representative of the only foods that you can eat to help you meet your omega-3 and omega-6 needs: They are simply the healthiest low-carb options. If you need help incorporating some of these healthy PUFA-rich foods in your diet, try some of the low-carb recipes below. Below are some delicious and healthy recipes that are filled with polyunsaturated fat. Plus, they are all keto-friendly. Note: To meet your DHA + EPA needs efficiently, incorporate recipes with salmon and other fatty fish at least twice per week. To help meet your omega-6 needs, use recipes that feature nuts, nut flour, seeds, seed meal, bacon, and eggs. Polyunsaturated fats (PUFAs) are typically referred to as healthy fats because they’ve been found to have a positive effect on various aspects of health, when eaten in moderation. As with all other fats, however, it is important to be mindful of your consumption to maximize the benefits and minimize any downsides. Make sure at least 500 mg of your daily omega-3 intake is coming from EPA + DHA. Prepare and store high-PUFA foods/oils properly to prevent oxidation. Are Omega 6s Healthy or Unhealthy? 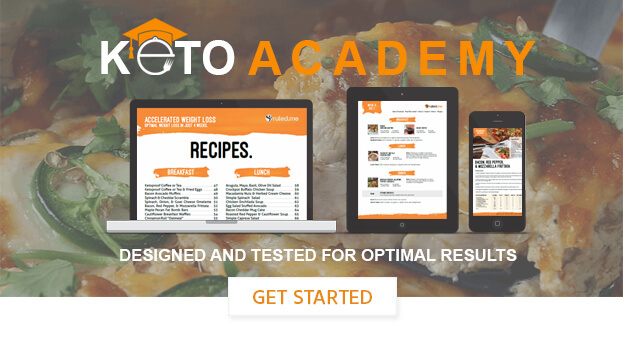 For more practical information on how to lose weight and improve health with a low-carb diet, check out our beginner’s guide to keto.